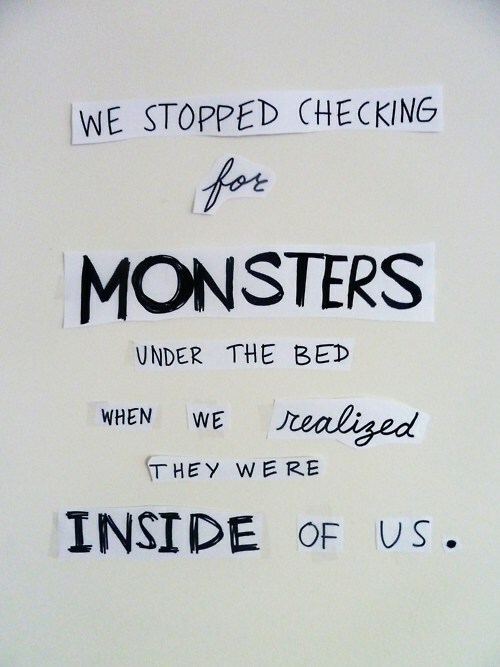 8 Responses to Those Damn Inner Demons…. WE HEAR YOU…WE HAVE THEM TOO! MONSTERS UNDER THE BED…TRY IN YOURSELVES!!! AND IN ME…BEFORE GOD’S DAILY CLEANSING OUT. I’m going through some stuff at the moment and it helps knowing everyone has those demons. I hope things work out for you! I slip into the same thing once or twice a year and even when I see it coming, I can’t seem to move out of my own way. You described it so well. If it’s any consolation, I’ll be willing to listen to your rants, your vents, and anything else you have bottled up within. It is a never-ending journey; there are good days and there are bad. When I’m in my good days, I’d think I’ve finally beaten my…compulsion if you will. But then one little comment or thought would just bring everything to head & I fall back into the same behaviours, routines. Don’t be angry at yourself. Sometimes it really just can’t be helped. If you get angry, you’ll fall into the vicious cycle that you know all too well. You said the key phrase: trek forward. It’s hard, it’s exhausting, but you’ve done it before and sometimes the journey again is even harder to go through, but you know you have it inside you to do it again.